The Matrix Map is a visual tool that plots all of the organization’s activities—not just its programs—into a single, compelling image. By illustrating the organization’s business model—through a picture of all activities and the financial and mission impact of each one—it supports genuinely strategic discussions. 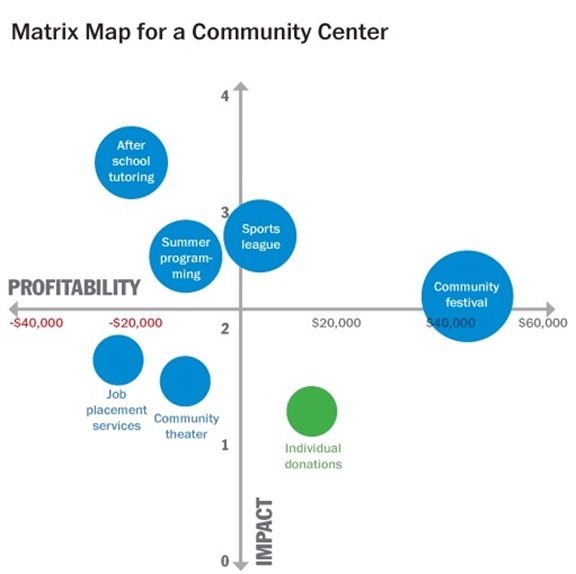 Below is an example of a Matrix Map for a community center. Each circle represents a business line. You can see that circles higher on the map have higher impact than those lower on the map. You can see the relative size of each activity, and which ones make money, which break even, and which require subsidy from the organization’s unrestricted funds. 1. Identify your business lines—all of them: A business line is a programmatic or fundraising activity in your organization that requires effort. Counseling, dance performances, citizenship classes, and forest restoration are all business lines. A fundraising phone-a-thon is a line of business, as is a special event or major donor solicitation. 2. Assess relative mission impact: In many nonprofits, there’s an implicit assumption that all programs are effective and important—and that’s typically true. But everyone also realizes—yet seldom says—that some programs have higher impact than others. We may not discuss impact levels in order not to sound as if we are criticizing a worthwhile program (or its director), but it’s precisely these judgments about which programs have the highest impact that the management team and the board should discuss as strategic choices are made. Alignment with core mission: How closely does this program align with our core goals? Some programs may be excellent, but not as central to our mission. Excellence in execution: Organizations are simply better at delivering some activities than others. A business line may be important to our mission, but we may not have the right skills or financial resources to implement it with excellence. This is a nice way of separating planning from execution. Scale: How many people does each business line affect? 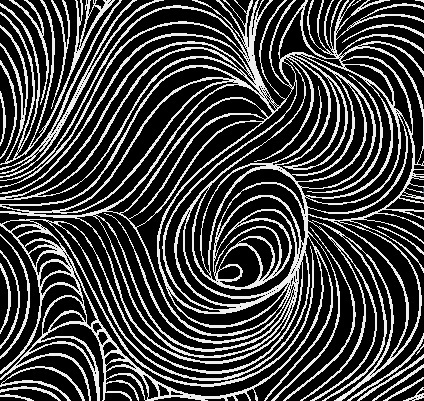 Depth: How deep an intervention or contact does each business line provide? Building community or constituency: How does this business line contribute to building, for example, the environmental movement or the Hillside Neighborhood (not just our organization)? Fills an Important Gap (FIG): If a business line were to go away, would your constituents be able to go across the street to another agency or would they have nowhere to go? 4. Map the results: Once these steps are done, you can map each business line on a grid. We put impact on the vertical axis (x axis) and profitability on the horizontal axis (y axis). More than just a picture, though, the Matrix Map can help engage board members in strategic discussions about how to strengthen the organization’s business model – understanding that the implications of their decisions will affect both impact and finances. And staff can see the whole organization at a glance in a way that focuses attention on activities and impact rather than as an organization chart. For many board members, the Matrix Map provides sudden clarity on how the organization’s different activities inter-relate. 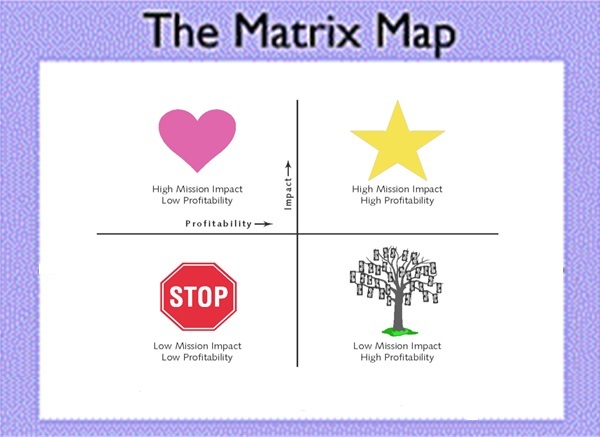 But beyond helping them understand the business model, the Matrix Map can help nonprofit leaders strengthen it. 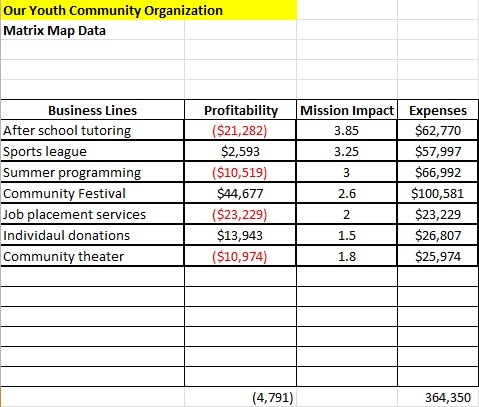 You’ll recall that putting together a Matrix Map calls for plotting your organization’s business lines according to their mission impact and financial profitability. Depending on where an activity is placed on the map, a strategic imperative emerges. These strategic imperatives are the actions that would most likely strengthen the business model and increase the organization’s sustainability. Note that not all Stars are programs. For instance, a strong annual fundraising dinner may be a Star: it may raise crucial unrestricted funds, convene and celebrate the organization’s constituency (such as a neighborhood, people working on minimum wage levels, a dance troupe, etc. ), and bring visibility to the organization and its work. For the community center, the afterschool tutoring and summer programming are hearts. These programs were what the organization was founded around, but as they have aged they have lost foundation funding and have no earned revenue strategy. Opposite the Hearts are our Money Trees, those activities that are lower in impact and generate surpluses usually used to subsidize the Hearts. They typically include our fundraising vehicles such as golf tournaments, raffles, and galas, as well as commercial activities such as parking lot rental income or food sales. 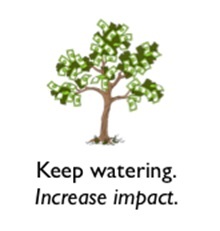 The strategic imperative for a Money Tree is to keep it, nurture it, and increase its impact. We often neglect Money Trees and expect them to continuously produce income year after year. But just like real trees, Money Trees require care and attention to stay fresh, stay healthy, and grow. 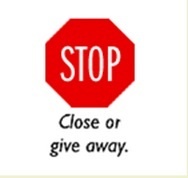 The strategic imperative for these Stop Signs is to close them or give them away to another organization. It’s not that these activities are useless, but they may be taking more of our resources than they warrant. 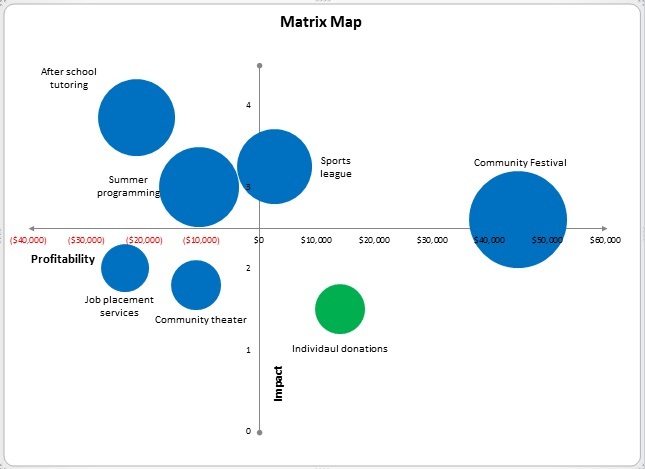 The Matrix Map looks at relative impact and raises the question of opportunity cost. 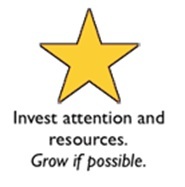 What if we invested the resources we spent on our low-impact program on one of our Stars? What if the time and attention our Stop Sign requires were focused on our Money Trees? For the community center, the job placement services and community theater represent Stop Signs. Job services were initiated by the organization when they saw a community gap. Since then a vocational service center has opened with a more comprehensive program and better attendance. 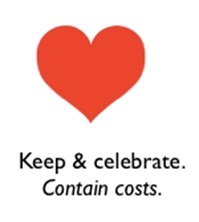 In terms of the community theatre: the center took this on when the local theatre closed its doors. Unfortunately, despite the desire to support the theatre, the center has not been able to strengthen programming enough to attract either audience or funding. Taken together, the strategic imperatives offer choices towards increased sustainability. These choices are not easy to make, nor can they be made “once and for all.” What is sustainable is constantly changing as the environment in which we operate is constantly changing. Funding sources may shift, and constituents’ needs may shift; what was once a Star may now be a Stop Sign. We must continually shift our programmatic and revenue strategies for our organizations to remain viable. Making strategy choices require judgment. The Matrix Map is a tool for board members and staff to make judgments informed by impact and finance, and in the context of the whole organization. Strategic imperatives provide a common ground for discussing the choices that face the activities in each quadrant of the map. And ultimately, making strategic decisions about each business line is what leads an organization towards a more sustainable future. These are not easy decisions with easy answers. Rather, the answer is often unclear. The Matrix Map offers a way to engage the entire board in the discussion, drawing on everyone’s minds. And ultimately, making strategic decisions about each business line is what leads an organization towards a more sustainable future. Steve Zimmerman, M.B.A., C.P.A., is principal at Spectrum Nonprofit Services, a consulting firm based in Milwaukee and focusing on business strategies for nonprofits. He is a frequent conference presenter and consults in strategy development to many types of organizations of many sizes.